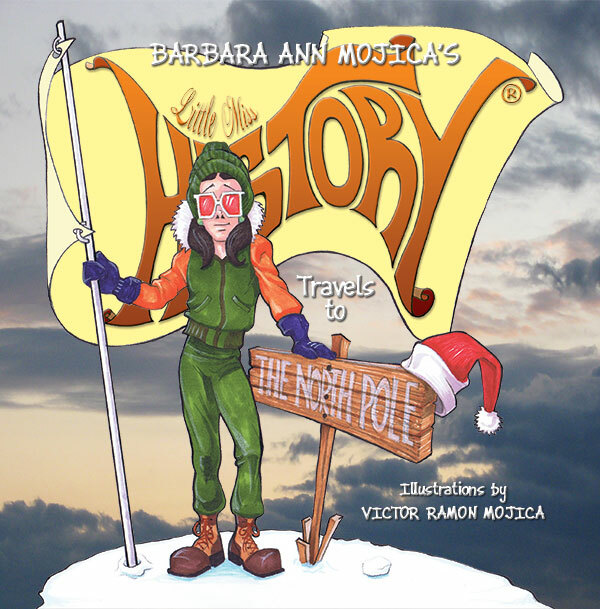 Spurring the imagination of young readers is something Barbara Ann Mojica does with a combination of elements that make her Little Miss History books such a success. The book is a wonderful Christmas present because Little Miss History is visiting the North Pole this time, and of course, Santa Claus figures into the history of this magical place. Mojica captures the mystery of the North Pole, one of the most unique places on Earth. She explains the geography, ecology and wild life of this special place. The history figures prominently in the book, from the Inuits to the famous explorations of the North Pole. Besides being a factually rich fun learning experience, the book is GORGEOUS. The illustrations are vibrant, with accurate details. Each page is to be savored, visited again and again. Each page leads the reader on to the next treasure. I can’t wait to give this Little Miss History Visits the North Pole to my grandson. Linda Maria Frank, author of The Annie Tillary Mysteries. The author provided the book for review. Thanks for sharing this great review at Booknificent Thursday on Mommynificent.com! So happy to share that the book has been really well received.